Dave Ulrich is on at AHRI this morning and I met up with him yesterday at an event ran by Halogen where Dave was speaking on his last book, Leadership Sustainability. 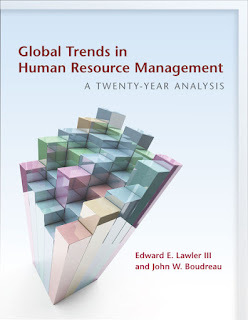 Although actually the last book he edited was the Rise of HR, a series of articles by 73 thought leaders. This post (still draft, sorry) is a review of that book, which has taken me a little while to get to, but I wanted to post for a couple of reasons. The Rise of HR is the first time that Dave has really started to explain his thinking about the art of HR. If you read yesterday's post on the new HR competencies you'll know this is something I influenced Dave around at last year's Art of HR conference in Croatia which I directed. Going into this event, Dave was clearly focused on HR as science vs art though did suggest that both are needed, as an aspect of paradox, which I agree with. Dave developed this slide for us *** which he is now using in many of his presentations around the world, including his explanations around the Rise of HR. The slide suggests that we need to focus on both puzzle (science) and mystery (art), based on some of Malcolm Gladwell's thinking previously. "Puzzle solving is about our role as architects, developing frameworks, collecting data, using science and investigating data using analytics." "Mystery investigation is about our role as anthropologists, undertaking inquiries, trends which are not yet fully understood, using art and asking questions about what's next - questions vs results." "We're architects but also anthropologists - we seek mysteries, observe, see patterns others don't see and provide unique insights on talent, leadership and culture." "Figuring out the future of HR and where we can create value isn't science but art. It's not a puzzle we're trying to solve but a mystery we're trying to investigate." 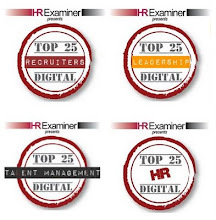 "HR leaders have an unprecedented opportunity to create the future of HR. Think of HR as an orchestra conductor, bringing together a highly diverse set of people and capabilities to harmonize answers to these complex organizational issues. The symphony orchestra conductor is not an expert at playing the violin, clarinet, flute, trumpet, and timpani. Rather, he or she is adept at finding the very best musicians who are expert at their respective instruments and bringing them together to produce beautiful music. The differentiating leadership role is orchestration, not universal expertise. It's also a shame that the CIPD's Peter Cheese trots out the same old nonsense in his chapter in the book about HR moving from science to art. 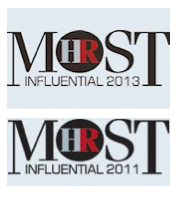 No - both are needed, and the rise of HR is primarily about artistry, not science. I got very excited about this strapline, as it suggests a focus on creating value - on developing strategy through and about people rather than just by focusing on the business. But it turns out that it's a tag for the HRCI which produced the book, not the book itself. Certainly there's nothing, or next to nothing, in the book about leading business, though Josh Bersin does suggest that our job is no longer to wait for someone to help but rather be a trusted business advisor. But there should be much more on this. This is what HR has to Rise to achieve. And if I'd managed to contribute a chapter to the book, this is what I'd have written about. The book is organised into the following sections - context, outcomes, analytics, governance and next steps. The context for HR is business strategy and Dave suggests this is increasingly about outside in. However it’s probably necessary to pick and choose from this list. I like Ian Siskin’s suggestion that it’s not going to be possible for HR people to become equally knowledgeable, prepared or able address all the new things confronting us (I think this links to Josh’s overwhelmed employee - and the overwhelmed HR practitioner!) Therefore we need to choose to lead, follow, or get out of the way - we don’t necessarily need to solve big hairy problem by ourselves, but we do need to ensure they are solved. Our outcomes are talent and organisation, and talent optimisation, ie what do we do with individuals identified as talent once we've recruited them? "I think we've had for the last 15 years in our field a wonderful and good focus on talent - the war for talent the McKinsey group put out. Today I think the theme should be victory through organisation. We don't win through having people, we win through having organisation." Dave asks what percentage of time the team with the best player on the team wins the World Cup - about 20%. For every sport it's about 15-20%. For movies it's the same for the last 20 years the movie of the year has featured the star. Of the year about 20% of the time. But the interesting thing is that it's featured the best director in the film about 70% of the time. Why? Because the director is able to ensure the stars are co-operating with each other. 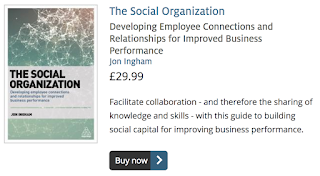 This is why another important outcome is people's relationships with each, social capital, or what Seth Kahan describes as dots and dot connectors and why Hugo Bague reminds us that organisational culture needs to be a group experience. That’s why I disagree with Josh Bersin's suggestion that compensation doesn’t need to be fair and equal but that some people really do deserve to make 10 times the rewards of others (actually I’ve got no issue with 10 times but the differential is much more than this today and that destroys the social fabric of our organisations. Similarly I disagree with him that today’s HR professional is more likely to be a talent expert, a technology expert and a consultant - and less likely to be an OD professional. For me OD is a central piece of what we need to become. This isn't about data but better decision making, establishing insight about what will happen in the future. Josh Bersin writes about replacing gut feel with data driven decisions. Personally I think both are needed, especially as we're talking about artistry (and Josh does suggest that HR is a craft). There are two sides to governance - building a new HR function, and ensuring a renaissance for HR - creating a new DNA through HR competencies, business partnering, 2.0, mindset, confidence etc. On the first of these points, Dave is clearly sick if the ongoing debate about HR structure, even if most people would suggest that he started and has been leading it. But these days he simplifies the issue as HR needs to follow (or lead?) the business. So whether HR should be centralised or decentralised depends upon which of these your business is. If you're centralised like McDonald's you'll need a strong central HR function. If you're a holding company like Berkshire Hathaway, Virgin or Tata you'll need a largely autonomous HR teams. In between these, most companies have elements of related diversification and for these you'll need a shared service orhpganisation, maybe consisting of four or five pieces ie centres of expertise, service centres, embedded professionals, operational consultants, a policy group, and increasingly temporary project teams. Take a look at the way every large consulting firm is organised as an example. 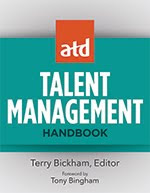 Josh Bersin suggests HR is a steward of people processes. Chee Wei Kwan suggests four roles of trusted advisor, passionate advocate, innovative marketer and astute facilitator. I like this and this they need to apply everywhere, not just Asia, though I think the roles need to be balanced more towards people rather than just the business. Eg he suggests that HR needs to speak the language that business appreciates. Or do we need to change that language? Dave Ulrich also suggests we need to focus less on roles and more on relationships. I agree and think there's some good thinking in his review of this. I love the idea of HR love maps for example. I just wish Dave would focus on relationships as one of our outcomes too - our relationships with our business clients are absolutely critical, but not as vital to the running of our businesses as the relationships our clients have with each other. And I'm looking forward to seeing Dave Ulrich speak before me on Thursday. I'm hoping he'll say something about the next version of his HR competencies which RBL and a group of partners, including AHRI, have been developing over the last year. This is my favourite competency from 2012 although I do explain it a bit differently to Dave. To me, this is about establishing a strategic position for a business, but it's about doing this through a focus on people (or organisational capabilities), rather than products, services or even core competencies. It's therefore a bit similar to Michael Porter's ideas around competitive positioning - which is why I like the name of the competency - but centred on the organisation rather than the business value chain. This competency still makes complete sense. Once you've identified the organisational capabilities which provide you with a strategic positioning, you then have to build these capabilities. However the name of the competency is dreadful as most people assume it's about individual not organisational capability. Also I think the three constituent elements of organisational capability - human, organisation and social capital all require different sorts of activities to build them. So I'd separate the competency out into these three areas. A bit of a mouthful but ideally I'd want to emphasise the need to build both skills and engagement, in the same way that Dave's roles currently emphasise both human capital development and employee advocacy. Dave's been saying for some time that we don't win through people, we win through organisation, and I suspect this will get more focus in the new version of the competencies. I also think that will be apt if it does. However, I'd expand it to cover workplace design as well, and despite my comments on the workplace conference I attended in Sydney, it was great to hear AHRI's Peter Wilson referring to workplace design as an HR capability in his introduction thus morning. We need more people to think like this. Although I don't want to distract from any of the above, much of what Dave and others mean when they talk about the organisation isn't the physical organisation at all, it's the people, but specifically the relationships between people. This is what I'm talking about tomorrow as the New HR. This is also still critical but I'd want to emphasise the prime need to focus on human oriented, digital technologies. My suggested name for an updated competency is Digital Activist. The activist part of the name comes from the current competency, Credible Activist, which I don't think we need as the other competencies together provide an activist approach, possibly with the exception of this technology oriented area, and I address the need for credibility below. Both parts of this is still critical too. I'd perhaps suggest a better title for it would be something like Best Fit Strategist - so it's about selecting, innovating, aligning and integrating the various activities to fit the needs of the value creation strategy and three capability building areas which I've identified above. I've already suggested that I don't think this is needed, though I do agree the need to gain credibility is key. I suspect that Dave may refocus this on being a business ally, supporting Ram Charan's ideas, but with more focus on outside in as well. I think it's less about this and more about developing the right relationships, and I love Dave's new focus on this area, and can't wait to see HR love maps become as common a part of what we talk about as the three legged stool is now. I use a model of relationship management developed by CM Parks which provides a ladder with different levels of trust edge eloped within a relationship. The highest score level of trust is being a friend in business. I love the model because it's easy to demonstrate that whereas sales people know they need to become a friend in business, most HR people still seek to draw a line some way below this level. I think that now credibility and relationships are so important we can no longer afford to do this. I'd suggest being a Friend in Business as the title of this new more relationship focused competency. This isn't a current competency but needs to be from now on. Dave suggests the half life of knowledge is about four years. Given this we can't rely on what we learn in our professional qualification but need to keep learning much more deeply throughout our careers. Someone at AHRI suggested yesterday that you've learned all you can in a job after four years. It's complete nonsense. Within that four years the job will have changed completely and you therefore need to learn a quarter of what you learned initially every year you stay in it. I've been in HR for 20+ years, invest heavily in my knowledge and skills, so I can bring my clients the very best and latest insights, and I still can't keep up with the amount of new stuff I need to learn, all of the time. Most HR people don't relative how far and how quickly they're falling behind, and we need to rebalance it. This doesn't exist currently either and Dave's not going to add it, but he might add something about being a data scientist, as analytics are now probably just as important as technology. But actually the need isn't about data, but wisdom, and despite the calls to move HR from art to science, we really need both of these to be developed. And actually I think Dave's moving in this direction too after having influenced him at the Art of HR conference last year. Dave designed a new slide for this focusing on architects (science) and anthropologists (art) and is using these at many of his presentations around the world now - it'll be fun if it comes up tomorrow! For Dave, the art is about what's next, questions rather than results, the trends which are not yet fully understood and creating HR for the future. Forget about science, this is what we now need to be doing! 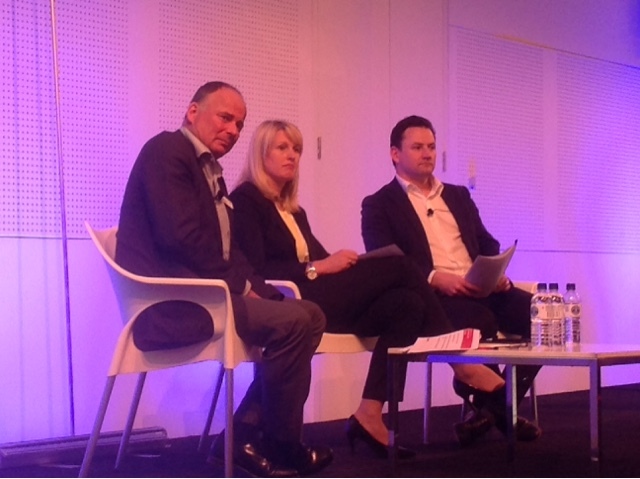 I'm now in a session with Steve Coster from architects Hassell's, Kylie Bishop from Medibank and John Scrivener Fahri from Qantas. I'm particularly interested in this session, firstly because it's great to see that although Sydney's Workplace design conference didn't involve HR, this HR one is including workplace design. And secondly because I've got a slide on Medibank's stairs in my own presentation on social capital and the New HR tomorrow. We looked first at Qantas' Mascot campus which looks great - much less beige than Woolworths from Sydney. And although the session is on organisation capital, this highlighted social capital too, as John suggested airlines are about as integrated a sector as you can possibly get, so collaboration is so important, particularly given their history of silos. Kylie then introduced Medibank's integrated model to people, facilities and technology. 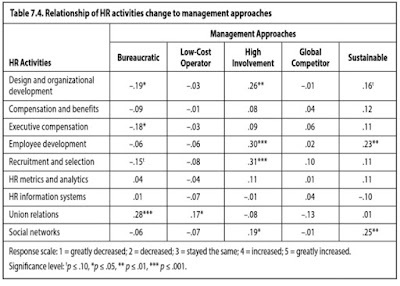 The key to an integrated model is being clear what you're trying to achieve (avoid shiny HR). For them this was their THRIVE objectives - health, collaboration, engagement and productivity, supporting activity based, output focused management. So the project wasn't just about the workplace but also eg leadership to influence their mind sets as well as behaviours. The economy has been stronger, especially in banking. So there's even more need to integrated HR and Property here than there is there. So as Steve suggested, HR needs to make friends with their Property managers - I'd agree and would suggest it's a much better basis for a G3 than Ram Charan's suggestion. 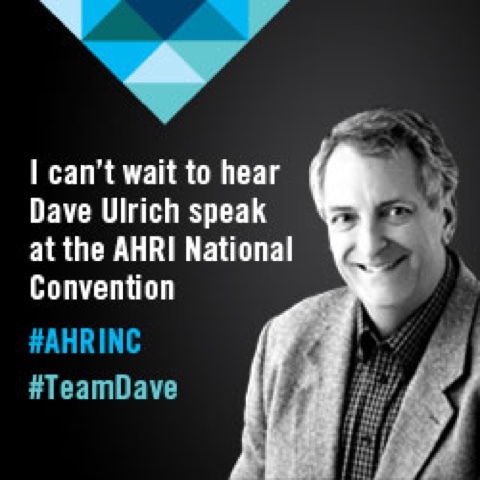 Tomorrow I'm presenting on the New HR at AHRI's national convention in Melbourne. 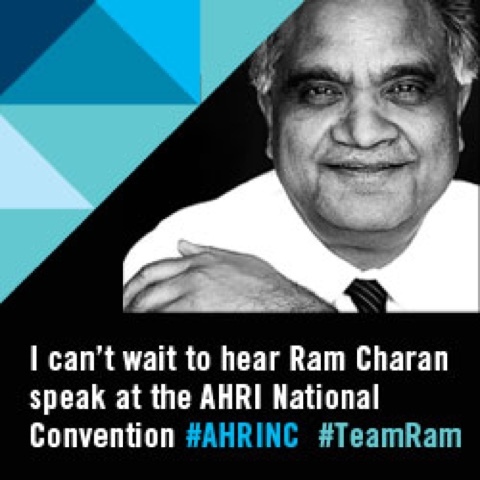 I'm looking forward to seeing Dave Ulrich again (more on that shortly) and also, sort of, to seeing Ram Charan today. You'll probably remember Charan from his intolerant swipe at HR in one of last year's Harvard Business Reviews. 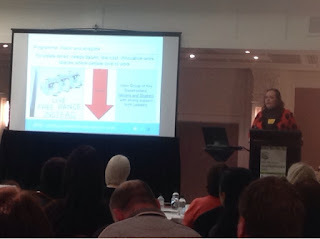 This was my intolerant swipe back - http://strategic-hcm.blogspot.com.au/2014/07/finance-are-from-mars-hr-are-from-venus.html - for which I think I got told off by Dave Ulrich, probably deservedly, at last year's Art of HR conference. 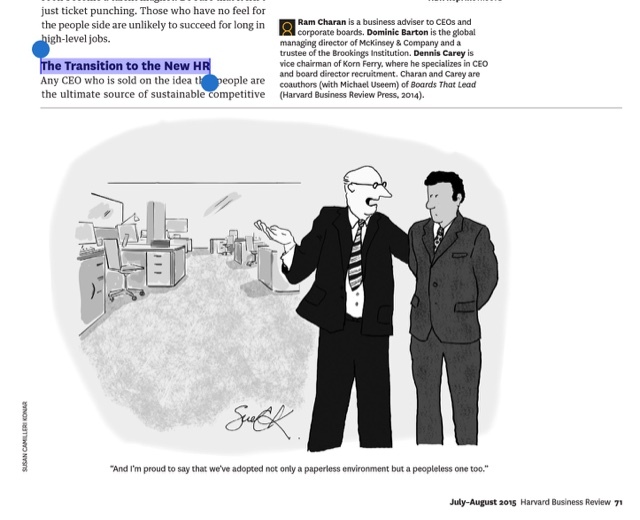 Charan has also been back again, in another article in last months's HBR feature on Blowing Up HR, titled People Before Strategy. He's a bit more tolerant in this article, arguing that instead of dividing HR into HR-A or HR-Admin (which stays as HR) and HR-LO / HR-Leadership and Organisation (which becomes part of Finance) HR should simply become part of a G3 (the Golden Triangle Anthony Hesketh has been talking about for at least a decade) working alongside the CFO and CEO. I don't agree that the development of Accounting into Finance is any guide towards the future development of HR. Finance and HR are very different functions and HR isn't on the same trajectory as Finance, just further behind - we're on a different trajectory to a different future. I don't agree that it's down to the CEO to elevate HR. This is our responsibility. In addition, most board members, particularly the compensation committee, have no idea what's need or possible in an ideal CHRO. Leaving it to the CEO is a sure fire way of developing HR as a pale imitation of Finance and opening the door to the future as HR-A. I also don't believe there needs to be a particularly critical relationship with the Finance Director. I actually think we can do much more with the other value creating functions particularly technology, property, marketing, procurement etc. And I don't believe our future is about Charan's suggested activities: predicting outcomes, diagnosing problems or prescribing actions. Planning for outcomes and actions, yes, absolutely. But predicting exactly who is going to do what or diagnosing why is a fool's errand as business life is just far too complex for this. That's why the performance of the CHRO can't easily be measured over each quarter too. I also worry that some of his decisions would take responsibility away from line managers and other business leaders. Yes, OK, HR professionals should have a great people acumen, I do agree with that, but most of the examples provided by Charan would simply increase the amount of bias inherent in strategic decisions about people - something we need to get away from, not embrace even more closely. However, the thing which has got me posting isn't any of the above points but the title of the article: people before strategy. 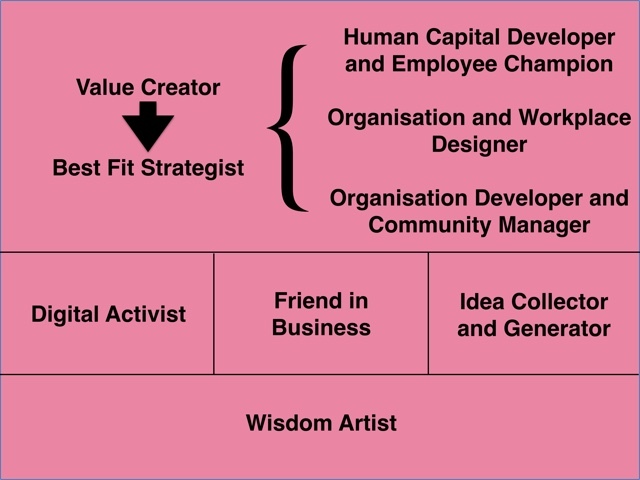 I'm a passionate proponent of putting people strategy before business strategy (creating value) and thought for a minute when I first came across the article that Charan had experienced a major shift in approach since last year. But actually that's not what he had in mind at all. 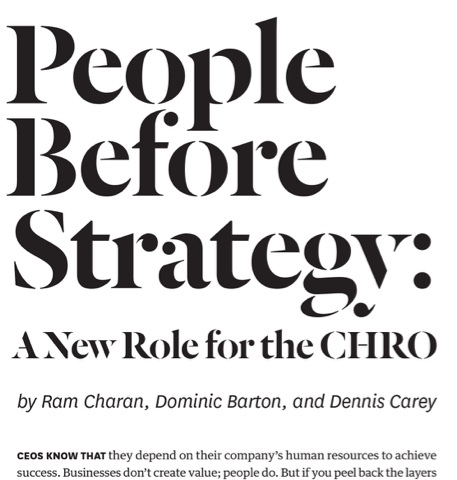 For Charan, people before strategy means checking you've got the right people at the top before involving them in developing the strategy of the business. That's very different to developing a strategy around all the people which will then enable the business to achieve better or different business results. There's one more point I wanted to call out too. This is that Charan refers to his CEO sponsored, Finance partnering, business judgment based HR as 'the New HR' which is the title of my presentation at AHRI's National Convention. For me, the new HR is something very different. Right at the beginning of the article Charan suggests that "Research consistently finds that CEOs worldwide see human capital as a top challenge, and they rank HR as only the eighth or ninth most important function in a company." Totally. But if human (and social) capital is so important then focus even more on it. Don't lose that focus by mixing it up with a broader and financially oriented view onto the rest of the business, which is already the focus of all of our other business colleagues, Finance in particular. Unless we take advantage of that opportunity I worry that we'll continue to operate in a very reduced capacity compared to Finance - a bit like the still too common case of the HRD reporting to the Finance Director rather than what I think Charan really wants to achieve from his G3. I commented recently on Peter Cappelli's article in July's Harvard Business Review. Cappelli's also been in HRE Online writing about the UK government's increase in the minimum / national living wage. Cappelli suggests the issue is that too many employers have been treating staff as mere resources and not investing in them as the source of their future productivity. I agree with that premise and do think the increase in the minimum wage was positive (see my earlier post on Britain needs a pay rise) but I'm not sure it's real evidence of a talent first strategy. And there are many aspects of UK policy which are still less positive - part of the reason why there's so much support within the UK opposition for Jeremy Corbyn as a very left leading future leader. Zero hour contracts are a good example. Whilst I don't believe there is anything innately evil with this form of employment, and actually I think the real issue is less about protecting jobs, and more about moving to a broader mix of ways of making a business contribution, the issue is that zero hours is very often applied in a decidedly non people first way. And rightly or wrongly the contracts are therefore largely discredited in the minds of employees and job seekers. The negative perception caused by coverage in the press. So the real issue isn't about zero hour contracts, it's about the organisational attitude to current and potential employees. And Glassdoor's survey as opposed to Peter Cappelli's article suggests that we've still got some room to go. I'm in Sydney on my way to AHRI's National Convention in Melbourne, staying at the Swissotel where I discovered a Next Generation Workplaces conference and have talked my way in to listen to Audrey Briel, Senior Executive, Workplace Flexibility at Woolworths. Their strategy has been to move from battery chickens to free range chickens! in an environment where costs are important given rising competition from Aldi and Lidl etc. This has needed space optimisation, office consolidation and to integration refurbishment into ongoing organisational changes. But it's also been about smart workplaces - eg having standard IT connections rather than old TVs, projectors etc in meeting rooms where connecting was always a hit and miss. Enablers including lockers, technology and AOdocs - Google's integrated documentation solution. There's been quite a bit of innovation especially for collaboration and encouraging creativity in an environment where people are used to working in cubicles. 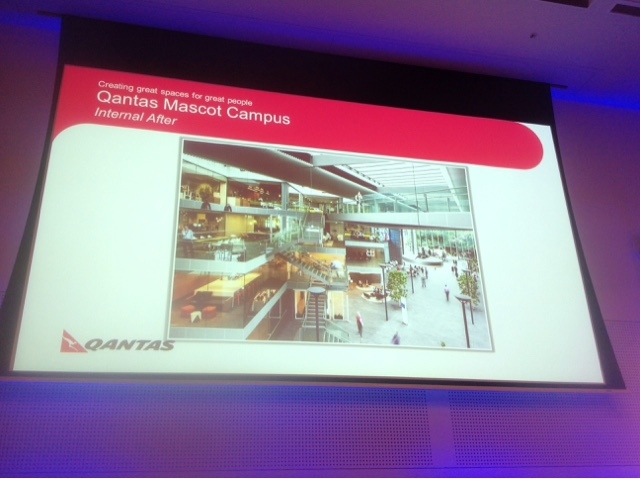 Importantly all the changes have been needs based rather than wants based (rather then creating funky offices!) and everything has been measured in terms of productivity etc. Also the change has been well planned and managed, for example by giving people the opportunity to opt in or out of the trial. I thought it was a good session / strategy but I'm not sure they've fully succeeded in creating an environment where people love to work. Perhaps that's partly because the field is still heavily influenced by, and this conference has been planned for Activity Based Working practitioners rather than HR professionals. Though I was pleased to here that Woolworths' planning group, the Movers and Shakers, involved staff from all functions across the business. 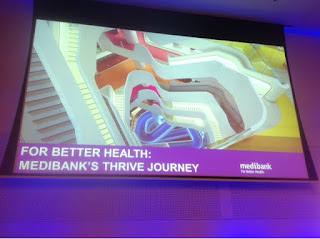 And I'm looking forward to Medibank's presentation on workplace design at AHRI's convention. Apologies for my lack of posting but I've been travelling through South East Asia for a few weeks. 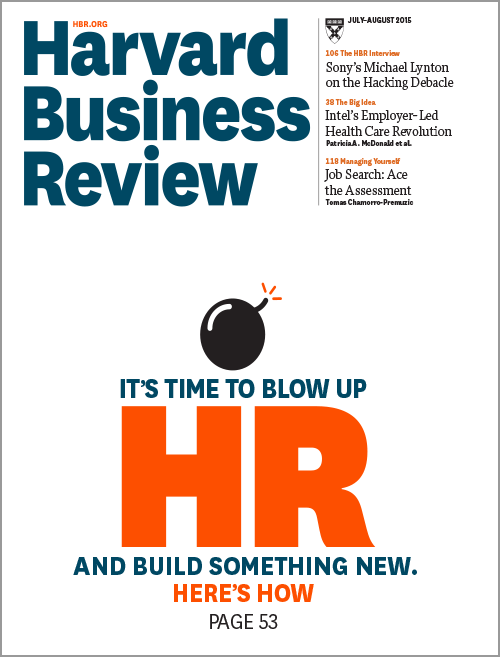 So I'm late on responding to Harvard Business Review's Blowing Up HR feature from July /August (2015). But I couldn't not respond, at least, to John Boudreau's article on HR's tendency to be seduced by things which are bright, new and shiny. Thinking everything needs to be based on big data. There are some good ideas in the article, such as avoiding this tendency, and some rather dumb ones, such as 'falling in love with the problem' - something which we should know from positive psychology will simply increase the size of the problem. But Boudreau is right about the need to understand the context for potential solutions before we decide whether one would be useful for us. It's just that the context is best set by the human and organisational outcomes we're trying to achieve, rather than the activities we're trying to avoid. Unfortunately outcomes are a bit of a blind spot for Boudreau - eg it's a problem in his Human Capital Bridge model for measurement and evaluation - see my review. It's also an omission in his recent book with Ed Lawler presenting an update on USC's ongoing research re HR effectiveness (Global Trends in Human Resource Management). The book presents some interesting findings, and also emphasises the need for best fit rather than new and shiny. 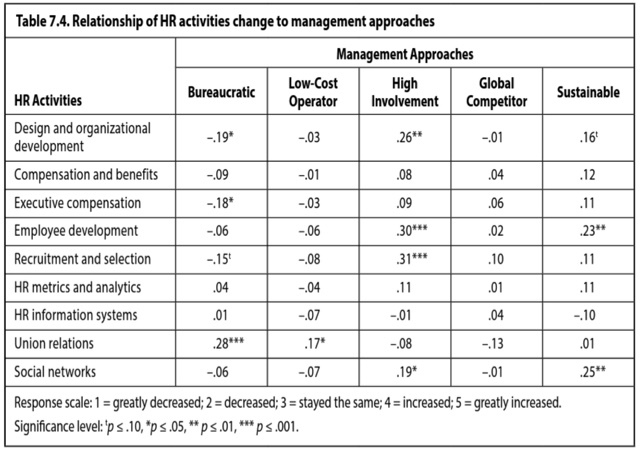 For example this graph shows how HR activities need to align with a firm's business strategy rather than just following best practice. Eg if you're following a bureaucratic or even a low cost business model, investing in union relations is going to help. But if you are emphasising globalisation you need to look elsewhere. 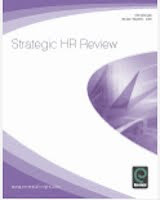 It's good research and an interesting book, but actually the links between HR activities and business strategy are too far removed to provide a sensible analysis. What would have made a lot more sense than the above would have been to correlate activities with outcomes and then outcomes with business needs. But unfortunately Boudreau doesn't think in these terms. You also see more of the same problem in Peter Cappelli's article within the Blow Up HR feature: Why we Love to Hate HR, and What HR can do about it. Cappelli's suggestions that HR focuses on layoffs, recruiting, flexible working arrangements and yes, performance management, are just more examples of someone's view about what's currently seen as shiny. The only way round this is issue is to focus on outcomes, understand existing and new thinking, but apply the processes and practices which your individual business needs. But love the business and workforce context, not just what's seen as the next most pressing problem.